This new model for 87Sr accumulation eliminates the need for either long-term decay of 87Rb, or the acceleration of 87Rb decay by many orders of magnitude. When diffusive isotope fractionation of Sr isotopes is repeated a sufficient number of times by within-mantle processes on isotopically-anomalous mantle xenoliths (each of which originally had low 88Sr/86Sr, high 84Sr/86Sr, and normal (0.7) 87Sr/86Sr ratios), the remnants of these xenoliths become isotopically heavy. In the process, these remnants also acquire near-normal (relative to the bulk Earth) 88Sr/86Sr and 84Sr/86Sr ratios, along with elevated 87Sr/86Sr ratios. When mixed with variable amounts of terrestrial nonradiogenic strontium, these remnants generate mixing lines indistinguishable from age-indicative Rb-Sr isochrons. Such mixtures also produce elevated 87Sr/86Sr signatures in oceanic crust, which are now routinely attributed, with much ambiguity, to prior crustal contamination. Although the unreliability of the Rb-Sr method for dating is readily demonstrated,1,2 it is important that alternative models are developed to explain the observed patterns of strontium isotopes. The ratios of 88Sr, 86Sr, and 84Sr, relative to each other, are commonly believed to be invariant throughout Earth materials. However, the ratio of 87Sr relative to the other Sr isotopes varies widely.3 This needs understanding in the light of the creationist-diluvialist paradigm. According to conventional uniformitarian beliefs, an elevated 87Sr/86Sr ratio (>0.70) necessarily implies a contribution of 87Sr from the decay of 87Rb, the latter of which has a half-life of about 49 billion years. In fact, Rb-Sr ‘isochrons’ are constructed with the ratio 87Sr/86Sr as the y-axis of the ‘isochron’. So how can Rb-Sr ‘isochrons’ be explained in the context of a young Earth? If Rb-Sr ‘isochrons’ are actually the result of mixing lines, the collinear relationship between 87Rb/86Sr and 87Sr/86Sr is readily explained. But what about the elevated and variable 87Sr/86Sr ratios? Some creationist scientists suppose that accelerated radioactive decay of 87Rb, by many orders of magnitude, is needed to account for the existence of excess 87Sr in the context of a young Earth.4 By contrast, in this work, a model is presented which bypasses radioactive decay of any nuclide to account for the observed 87Sr/86Sr ratios. For example, in the Allende chondrule, the effects of strontium isotope fractionation were automatically removed in the conventional normalization to 88Sr/86Sr of 8.37521,10 or its reciprocal, 0.1194, quoted above. Real, natural isotopic fractionation was later found in this meteorite only as a result of special investigation. Specialized procedures have to be followed to circumvent the ratio-normalization procedures.11 The new model for heavy-isotope fractionation, developed in this work, avoids any situation where one isotopic ratio is used to correct another. For example, the trends in calcium-isotope ratios are consistent with mass-dependent isotope fractionation.16 However, the trends in the calcium and magnesium anomalies are the opposite of what would result from mass dependent isotope fractionation. This prompts the rather cumbersome suggestion that a complex process of vaporization and condensation had been responsible (i.e. each element’ isotopes being fractionated during separate episodes). Furthermore, magnesium-isotope anomalies within inclusions of the Allende meteorite show a linear relationship between 26Mg/24Mg versus 25Mg/24Mg,17 which is exactly what is expected from mass-dependent isotope fractionation. But there are other values for magnesium isotopes which plot far off this line, and for which the decay of now-extinct 26Al is invoked. How common is heavy-element isotopic fractionation on Earth? It may surprise some readers to learn that there is no clear answer to this question. As noted earlier, routine studies using normalized mass spectrometric corrections obscure isotopic anomalies. Variations in the 86Sr/88Sr ratio for Earth materials commonly fall within the range of 0.1187-0.1206,21 in contrast to the accepted standard ratio of 0.1194. Uniformitarians believe that, with the possible exception of the earliest stages of its history, Earth materials have never been in a gaseous phase. Except for localized events such as asteroid impacts, there probably was never a circumstance during which silicate materials would ever reach their boiling point. If such reasoning is also valid within the creationist-diluvialist paradigm, then gas-phase isotope fractionation mechanisms have little relevance for the purposes of this study, and are henceforth ignored. Thus, we focus our attention on the liquid phase. The element in question must diffuse from an area where it occurs at high concentration to one of low concentration (Figure 1).32 As illustrated in the figure, the isotope fractionation that occurs during diffusion is necessarily a contact phenomenon between the high- and low-concentration areas. Although the diffusivity ratios of strontium isotopes in silicate melts have apparently never been measured, they should be comparable with calcium. This is because elements within the same group of the periodic table exhibit comparable diffusivities of their respective isotopes relative to each other. The diffusion coefficients of elements in electrolyte solutions are considerably greater than those in liquid magmas. The value for the latter range from 10-6 to 108 cm2/sec.26,30,32,33 Those in aqueous electrolyte solutions can be at least two orders of magnitude greater.38 For instance, at 25oC, they are about 10-5 cm2/sec,39 and this value rises to about 10-4 at temperatures of 500oC to 700oC. Figure 1. Diffusion of Sr in magma (a) and rock (b). The darker magma/rock to the left has a high Sr concentration while the lighter magma/rock to the right has a low Sr concentration. Diffusion of Sr occurs at the concentration gradient. In the magma (a) the concentration gradient is confined to the narrow zone at the contact, and extends only several cm at the most. For the rock (b), the concentration gradient is confined to the contact between the solution and the rock. However, the extensive porosity in the rock can allow the electrolyte solution to extend from several metres to tens (or even hundreds of kilometres). where X is the distance diffused by a molecule, ion or isotope, D is the diffusivity, and T is the time elapsed. Thus far, the only studies on isotopic fractionation in medium to heavy elements, in a well-defined geologic context, have been limited to contact effects in magmas, as is depicted in Figure 1a. Because of fractionation during diffusion, the element is slightly isotopically heavier on the high-concentration side of the boundary, and slightly isotopically lighter on the low-concentration side of the boundary. As shown in Figure 1a, a concentration gradient exists across the boundary. With time, the gradients, shown as a hyperbolic curves throughout Figure 1, flatten out.30 In other words, as noted earlier,32 the gradient is smoothed over. The previously-existing sharp difference in elemental concentrations across the magma boundaries are erased, and further isotopic fractionation of that element is thereby prevented from taking place across that boundary. Regardless of the exact mechanism involved, the magnitude of isotopic fractionation, in relation to the magnitude of the concentration of the isotopes, is almost always small.43 However, this conventional reasoning presupposes that isotopic fractionation in heavy elements is, at most, a one-time event. But, like the proverbial final straw that broke the camel’ back, a trivial occurrence becomes significant if duplicated a sufficient number of times. In like manner, were isotopic fractionation repeated enough times, a major alteration in the isotopic ratios of the chemical elements would result. Moreover, were the repetitive isotopic fractionation on the same material to occur on a volumetric scale commensurate with a large fraction of the Earth’ mantle and/or crust, then appreciable amounts of the chemical elements with considerably-altered isotopic ratios would result. With the notable exception of the repeated fractionation of hydrogen and oxygen isotopes which occur during repeated cycles of precipitation and evaporation,5 it does not appear that repeated fractionation of isotopes, let alone that which involves large fractions of Earth materials, has ever been contemplated, let alone researched. It is for this reason that this paper has been written. The model presented relies on the repeated movement of within-earth materials past each other (Figure 3), constantly creating new interfaces (such as shown one-time in Figure 1) through which isotopes can diffusive repeatedly, and undergoing repeated isotopic fractionation. Even though God created the Universe, including the Earth, by Divine fiat on the first day (Genesis 1), we must consider the possibility of extensive movement of within-Earth materials on the first day or so of its existence as a result of speeded-up quasi-natural geochemical processes.44 The model which I propose allows for God having assembled our planet from previously-made chunks or ‘blobs’ of material having divergent strontium-isotope ratios. Some of these chunks were embedded deep within the Earth, and gradually experienced equilibration of their strontium isotopes with those of the rest of the Earth through the process of isotope fractionation. In doing so, variable and often elevated 87Sr abundances, relative to the other strontium isotopes, were generated. More on this shortly. a means of constantly renewing this gradient. Recent work by Dreibus, Jagoutz and Wanke indicates that the mantle contains about 400 ppm of water,46 which is considerably more than generally supposed. Further evidences of water in the mantle are discussed and documented elsewhere.47 Of course, the foregoing need not be an all-or-none situation. Parts of the Earth’ surface are very wet, and others are completely dry. The same can hold for the mantle. Because of the likelihood of appreciable water in the lower crust and mantle, the capability of aqueous fluids to carry dissolved strontium to depths of several tens of kilometres (at least), and laterally therein for at least comparable distances, should be seriously considered. Next, we must consider mechanisms, which constantly renew the concentration gradients of strontium. If there were any kind of physical movement within the mantle, as illustrated in Figure 3, it would set the stage for repeated isotope fractionation. Lamella 2 moves up (relative to Lamella 1), and the strontium diffuses across the interface near 1Z/2R. Lamella 3 moves up, in analogous fashion, relative to Lamella 2. This allows the isotopically-light Sr to diffusive across the 2R/3K boundary. Successive movements of other Lamellae allow for continuous diffusion across the boundaries marked 3K/4F, and finally, 4F/5A. The strontium is diffusing left to right in a straight line. The relative movement of Lamellae creates the illusion of a stepwise movement. The end result is a very isotopically-light strontium in Lamella 5. Meanwhile, the Sr source in Lamella 1, pictured at the far upper left of Figure 3, acquires a new interface with Lamella 2 every time that Lamella 2 moves up relative to Lamella 1. With each such relocation, the Sr source preferentially sheds its light isotopes into each new contact zone material within Lamella 2. The end result is a Sr source that is very isotopically heavy. But what kind of lamellar interfaces, as pictured in Figure 3, could actually exist in the mantle? One possibility is the sharp boundary between magmas of very different compositions. However, turbulent transport would tend to erase any incipient isotope fractionation in such circumstances. The lamellae could instead be tectonic in nature. But this seems unlikely, since the mantle material is not brittle but—to the contrary—mechanically ductile. Yet it is this very ductility which provides the answer. Patches or ‘blobs’ of high-Sr material could be smeared by both normal and shear strains within the mantle. This process is similar to what is believed to take place in accordance with the marble-cake model of the mantle,27 except that it is a Sr-rich basaltic-composition material that gets smeared out instead of pyroxenite. For the foregoing repeated-dilution mechanism to work (Figure 3), the surrounding mantle must have a very low (almost zero) background concentration of strontium. Such is the case. Estimates for the strontium content of the Bulk Silicate Earth (crust plus mantle) range from 10 ppm to nearly 28 ppm.48 (Of course, the present mantle, having undergone severe extraction of strontium during the formation of the crust, has much less strontium.) This means that, were the ‘blobs’ of highly-concentrated strontium embedded within the pre-differentiated Earth, each of these ‘blobs’ would necessarily have been surrounded by a large volume of strontium-poor mantle material into which the strontium could be transported by diffusion in aqueous solutions. The repeated dilutions of strontium contents, caused by the movements of lamellae past each other (Figure 3), would not erase the concentration gradients for a long time. Figure 3. A mechanism which could have constantly renewed the concentration gradients of strontium within the mantle. Sr diffuses from the Sr source at the far upper left across the low-Sr lamellas, fractionating the Sr isotopes and gradually reducing the concentration gradient. Subsequently, vertical movement of the lamellas again brings low-Sr material into contact with the high Sr source allowing for multiple fractionation. The scale is comparable with that for Figure 1(b). To what extent can strontium isotopes fractionate? It is well known that strontium behaves similarly to calcium, and it is recognised that calcium may at least theoretically be fractionated by interstitial fluids.49 Let us consider the consequences of fractionating the presently-existing strontium isotopes. Using b exponent values of 0.1 and 0.05 in Equation (1), a spreadsheet program was used to calculate the isotopic abundances, which would result from the repeated diffusive isotopic fractionation of strontium isotopes. The results are presented in Tables 1 and 2. With repeated fractionation, one gets almost pure 88Sr, or, by fractionating bulk strontium in the opposite direction, almost pure 84Sr (Table 1). Furthermore, as the 87Sr/86Sr ratio becomes increased above 0.7 as a result of isotope fractionation in Earth materials (Table 1), the abundance of 88Sr quickly rises to nearly 100%, and that of 84Sr even more quickly approaches zero. Because this type of isotopic fractionation is entirely mass-dependent, it is impossible to elevate the 87Sr/86Sr ratios without simultaneously changing all of the other strontium isotope ratios. What about mixtures of differently-fractionated strontium? A series of mixing simulations demonstrates that isotopic fractionation is insensitive to mixing. For example, as can be seen in Table 2, the isotopic abundance after 100 continuous episodes of fractionation are almost identical to those resulting from a mixture of equal volumes of materials fractionated from a range of from zero to 200 times. This is a significant result, as it simplifies the overall analysis of complex isotopic fractionation in the following manner: One number (the times an element was fractionated) can serve as a stand-in for a series of fractionations. However, as can be seen in Table 3, mixtures of previously-fractionated strontium cannot be combined in any manner that elevates the 87Sr/86Sr ratios and simultaneously recovers the near-normal bulk-Earth 86Sr/88Sr and 84Sr/88Sr ratios. To investigate this further, more complex hypothetical mixing simulations were performed. This time, there were repeated rounds of isotopic fractionation of strontium, in both the light and heavy directions, successively imposed upon mixtures of normal, isotopically-light, and/or isotopically-heavy strontium. In each case, the goal was the normal bulk-Earth 86Sr/88Sr ratio of 0.1194. A few of the results are shown in Table 4. It turns out that, under such conditions, the elevated 87Sr/86Sr ratio not only disappears, but becomes smaller than the bulk-Earth 87Sr/86Sr ratio of 0.7. One can conclude that the 87Sr/86Sr ratio can be lowered, but not elevated, by a complex alternating series of mixings and fractionations. Up to now, all of the hypothetical fractionation simulations had some variant of bulk-Earth strontium isotopic ratios as the starting point. To explore other possibilities, a study was made of the strontium isotope ratios that are believed possible as a result of nuclear processes. While some of these ratios are comparable to those of bulk-Earth materials, others are very different.52 For instance, some modelled nucleosynthetic processes allow for high abundances of 84Sr at the expense of all the other strontium isotopes,53 while other nucleosynthetic models emphasize that 88Sr can form at rates considerably less than is commensurate with its high relative abundance in bulk-Earth materials.54 Both tendencies are shown, to varying degrees, in the isotopic starting points of the three fractionation simulations in Table 5. As for the relative abundances of 86Sr and 87Sr, virtually every nucleosynthetic model surveyed suggests that the former is almost always at least slightly more abundant than the latter.55 This apparent fact is reflected in the choice of ratios of the two isotopes, relative to each other, as the starting point of each of the three hypothetical fractionating simulations shown in Table 5. Figure 4. Mixing lines are easily generated by the mixing of material from a fractionated, heavy-Sr isotope xenolith with material from the light-Sr isotope mantle, without prior radiogenic production of 87Sr. Earlier, the consequences of isotopically-inhomogenous masses of material within the Earth had been discussed. Also, as noted earlier, I postulate that God had created the Earth out of previously-made chunks of materials, many of which differed from each other, in terms of strontium-isotope concentration. (I henceforth refer to the ‘blobs’ as extraterrestrial xenoliths, not because they came from space, but because their isotopic composition is foreign relative to the bulk of Earth material, which had originated from other God-directed nucleosynthetic processes). I suggest that these xenoliths have been incorporated within the Earth’ mantle during the time that the Earth was being assembled by God on the first day of Creation Week. In accordance with some of the nucleosynthetic processes discussed earlier, consider a situation wherein the extraterrestrial xenoliths started out with simultaneous lower abundances of 88Sr and higher abundances of 84Sr than is true of bulk-Earth materials. This means that the presently-seen relative abundances of 88Sr and 84Sr, in remnants of the extraterrestrial xenoliths, came about as a result of the elevation of the former and diminishing of the latter during isotopic fractionation in the direction of the heavy isotopes. Examples of this can be seen in Table 5. We end up with elevated87Sr/86Sr ratios along with near-normal 86Sr/88Sr and 84Sr/86Sr ratios. After this isotope fractionation, the material with elevated 87Sr/86Sr ratios became incorporated into igneous bodies. As a result of two-component mixing,56 pseudoisochrons were formed which have no time significance (Figure 4). For the vast majority of ‘isochrons’, only a modest elevation of 87Sr/86Sr ratios occurs above 0.7, and thus a relatively small number of fractionations can account for this (Simulation 1, Table 5). However, there are a few mineral ‘isochrons’, which contain minerals with 87Sr/86Sr ratios in the hundreds or even thousands. But the amount of material with such extremely high 87Sr/86Sr ratios is, volumetrically speaking, extremely uncommon in the Earth’ crust. It can be understood as the outcome of rarely-occurring extremely long series of fractionations (Simulation 3, Table 5). As to the belief that such high 87Sr/86Sr ratios could only have resulted from in situ 87Rb decay, we must remember that most mineral ‘isochrons’ are ‘too young’2,39 relative to whole-rock ‘isochrons’, which is another way of saying that the 87Sr/86Sr ratios found in most minerals are not commensurate with the concentration of 87Rb in these same minerals. The earlier belief that a collinear relationship between 87Rb/86Sr and 87Sr/86Sr could only be caused by radioactive decay of 87Rb has given way to the recognition that such a relationship can also be a mixing line.2,51 The theory developed in this paper takes this a step further, and provides a non-radiogenic explanation for the variable and elevated87Sr/86Sr ratios observed in rock. As a result, the need to postulate acceleration of radioactive-decay rates by many orders of magnitudes is eliminated for the Rb-Sr system. The model developed in this paper can also help solve other geologic problems. For instance, the conventional belief that elevations in the 87Sr/86Sr ratio above about 0.7 are assumed to be the result of either in situ or once-present 87Rb decay causes unnecessary interpretative puzzles in isotopic geochemistry,57 and these can now be avoided. I am grateful for helpful discussions with many researchers in this field. Most if not all of these individuals would like to remain anonymous for obvious reasons. I also thank Mr Tim McNabb for drafting the figures in this work. Woodmorappe, J., Studies in Flood Geology, 2nd ed., Institute for Creation Research, El Cajon, 1999. Woodmorappe, J., The Mythology of Modern Dating Methods, Institute for Creation Research, El Cajon, 1999. In fact, in some terrestrial minerals, 87Sr is the most common isotopic species of strontium. For purposes of studying strontium isotope geology, 86Sr has been chosen as the non-radiogenic stable reference isotope with which to compare87Sr. Hence the oft-quoted 87Sr/86Sr ratio. For example, Humphreys, D.R., Accelerated nuclear decay: a viable hypothesis? in: Vardiman, L. et al. (Eds), Radioisotopes and the Age of the Earth, ICR and CRS, California, Missouri, pp. 333-379, 2000. Slight differences in mass between different isotopes cause their fractionation. Although there are other mechanisms by which isotopes can be separated in nature, these are not explored in this work. Hoefs, J., Stable Isotope Geochemistry, 4th Edition, Springer-Verlag, Berlin, Heidelberg, New York, 1997. The words ‘heavy elements’ are used here in an informal sense to refer to elements heavier than about nitrogen. Until fairly recently, spectrometers were not sensitive enough to detect isotopic differences, on a routine basis, for many of the heavy elements. Of course, the published literature is limited to individual studies of individual elements, and these are much more likely to reflect the interest of the researcher than the extent of actual isotopic fractionation in nature. Esat, T.M., Physicochemical isotope anomalies, Geochimica et Cosmochimica Acta 52:1409-1424, 1988. Hofmann, A.W. and Hart, S.R., An assessment of local and regional isotopic equilibrium in the mantle, Earth and Planetary Science Letters 38:44-62, 1978. Patchett, P.J., Sr isotopic fractionation in Allende chondrules: a reflection of solar nebular processes, Earth and Planetary Science Letters 50:181-188, 1980. The double-spike technique has to be used in order to detect and measure the extent of the strontium isotope anomalies in both terrestrial and extraterrestrial materials (e.g. Patchett, Ref. 10). In rare cases, to make sure that real natural isotope fractionation effects in strontium are not overlooked (notably within certain meteorites), an automatic correction to the 84Sr/88Sr of 0.006745 is made (Papanastassiou, D.A. and Wasserburg, G.J., Strontium isotope anomalies in the Allende meteorite, Geophysical Research Letters 5(7):595-598, 1978) in addition to the standard one for 86Sr/88Sr. In the vast majority of investigations, though, the 84Sr/88Sr ratio is neglected, partly because of the difficulty of measuring it accurately. For example, in the Allende meteorite, some inclusions show negative anomalies in 142Nd, 146Nd, 148Nd, and 150Nd. By contrast, the anomaly in 145Nd is positive (McCulloch, M.T. and Wasserburg, G.J., Barium and neodymium isotopic anomalies in the Allende meteorite, The Astrophysical J. 220:L15-L19, 1978). For some elements where a nucleosynthetic origin has been advocated to explain their isotopic anomalies (e.g. samarium: Clayton, D.D., On isotopic anomalies in samarium, Earth and Planetary Science Letters 42:7-12, 1979), a straightforward steady-state nuclear process has been ruled out. Instead, a veritable ‘dance’ of ad hoc stellar processes has been invoked. Clayton, R.N., Hinton, R.W. and Davis, A.M., Isotopic variations in the rock-forming elements in meteorites, Transactions of the Royal Society of London A325: 483-501, 1988. Esat, T.M. and Taylor, S.R., Isotope fractionation in the solar system, International Geology Review 41:31-46, 1999. For instance, some of the calcium and titanium isotope anomalies in the Allende and Leoville meteorites are consistent with an origin in terms of neutron-rich nucleosynthetic processes in stars, while the absence of certain calcium and titanium isotopes is inconsistent with such an interpretation (Niederer, F.R. et al., Absolute isotopic abundances of Ti in meteorites, Geochimica et Cosmochimica Acta 49:835-851, 1985). Elsewhere, the anomalies in titanium isotopes are instead attributed to neutron-capture s-processes (slow nuclear processes) within stars, with the anomalies scaling in proportion to the known neutron-capture cross sections of the respective titanium isotopes (Ireland, T.R. et al., Isotopically anomalous Ti in presolar SiC from the Murchison meteorite, The Astrophysical J. 376:L53-L56, 1991). Niederer, F.R. and Papanastassiou, D.A., Ca isotopes in refractory inclusions, Geochimica et Cosmochimica Acta 48:1279-1293, 1984. Esat, T.M. et al., Magnesium isotope composition of interplanetary dust particles, Science 206:190-197, 1979. Clayton, D.D., On strontium isotopic anomalies and odd-A, p-process abundances, The Astrophysical J. 224:L93-L95, 1978. Richter, U.O. and Bagemann, F., S-process isotope anomalies: neodymium, samarium, and a bit more of strontium, Abstracts of Papers to the 23rd Lunar and Planetary Science Conference, pp. 1147-1148, 1992. The data is compatible with either a 3.2 permil deficit in either 84Sr or 88Sr, or else a 1.6 permil excess of 86Sr (Papanastassiou and Wasserburg, Ref. 11). Exposure to a neutron flux would explain the pattern of Sr isotopes but not the simultaneous existence of large amounts of 149Sm, whose neutron-capture cross-section is much greater than that of the relevant strontium isotopes, and which therefore should have been consumed in a neutron-rich environment. Thirlwall, M.F., Long-term reproducibility of multicollector Sr and Nd isotope ratio analysis, Chemical Geology 94:85-104, 1991. In addition, throughout his lifetime of work on strontium isotopes, one strontium-isotope specialist (personal communication) reports encountering the aforementioned ratio within the range of 0.116-0.123. But, as discussed earlier, it is impossible to know, in the absence of specialized studies, whether any ratio deviating from 0.1194 is caused by natural isotopic fractionation, or if it is an artefact of the spectrometer. It appears that the general belief among scientists has long been that the nonradiogenic isotopes of strontium are identical everywhere on Earth, and that it is unfruitful to search for isotopic anomalies among them. Hidaka, H. and Masuda, A., Nuclide analyses of rare earth elements of the Oklo uranium ore samples: a new method to estimate the neutron fluence, Earth and Planetary Science Letters 88:330-336, 1988. Hidaka, H., Sugiyama, T., Ebiharu, M. and Holliger, P., Isotopic evidence for the retention of 90Sr inferred from excess90Zr in the Oklo natural fission reactors: implication for geochemical behaviour of fissiogenic Rb, Sr, Cs, and Ba, Earth and Planetary Science Letters 122:173-182, 1994. The quoted value is +148 permil isotopically lighter than the usual 88Sr/86Sr ratio of 8.37. It is interesting to note that some irregularities in uranium isotopes have been known for decades (Cowan, G.A. and Adler, H.H., The variability of the natural abundance of 235U, Geochimica et Cosmochimica Acta 40:1487-1490, 1976), but nothing was made of this fact until decades later, after the existence of natural nuclear reactors had been widely accepted. Cowan and Adler acknowledge that, had the data been published earlier, it would have been attributed to isotope fractionation. Have other terrestrial isotopic anomalies likewise have been found, but ignored, because they don’t fit current theories? One world-class authority on strontium isotopes suggested that, were an investigator to obtain an anomalous isotope reading, he or she would be prone to regard it as instrument error and ignore it. How many samples of terrestrial materials have been explicitly checked for isotopic anomalies in just the element strontium? I have been unable to find a clear answer in any authoritative source. Morozova, I.M. and Alferovskiy, A.A., Fractionation of lithium and potassium isotopes in geological processes, Geochemistry International 11(1):17-25, 1974. Verbeek, A.A. and Schreiner, G.D.L., Variations in 39K:41K ratio and movement of potassium in a granite-amphibolite contact region, Geochimica et Cosmochimica Acta 31:2125-2133, 1967. Beard, B.L. and Johnson, C.M., High precision iron isotope measurements of terrestrial and lunar materials, Geochimica et Cosmochimica Acta 63(11/12):1653-1660, 1999. Beard, B.L et al., Iron isotope biosignatures, Science 285:1889-1892, 1999. Anbar, A.D. et al., Nonbiological fractionation of iron isotopes, Science 288:126-128, 2000. Marechal, C., Telouk, P. and Albarede, F., Precise analysis of copper and zinc isotopic compositions by plasma-source mass spectrometry, Chemical Geology 156:251-273, 1999. The range of isotopic fractionation in copper (9 permil) is greater than that in zinc (just under 1 permil), probably because of the alternate oxidation states in copper. One should not make much of the very small observed range of isotopic fractionation in zinc because only a few samples were analyzed. Allegre, C.J., Isotope geodynamics, Earth and Planetary Science Letters 86:175-203, 1987. Allegre, C.J. and Turcotte, D.I., Implications of a two-component marble-cake mantle, Nature 323:123-127, 1986. Edwards, B.R. and Russell, J.K., Time scales of magmatic processes: new insights from dynamic models for magmatic assimilation, Geology 26(12)1103-1106, 1998. This form of isotopic fractionation is mass-dependent. The lighter isotopes are, by virtue of this fact, slightly more mobile than their heavier counterparts. A series of isotope-fractionation steps in which strontium isotopes are separated is feasible because it is a trace element. More commonly-occurring elements are unlikely to be fractionated, at least in a series of cumulative fractionation events, because there are hardly any locations where they occur in sufficiently low abundance, and to where they could diffuse. Jambon, A., Isotope fractionation: a kinetic model for crystals growing from magmatic melts, Geochimica et Cosmochimica Acta 44:1373-1380, 1980. The exponent, b, is characteristic of self-diffusion in a gas, for which its value is 0.5. In other words, the diffusivity-ratios of gaseous isotopes scale as the square root of the ratios of their respective masses. I have been told that the b value of 0.5 is essentially a holdover from the work of Harold Urey in the 1940s. Urey assumed that mass resonances apply to mass differences of the same isotope. Subsequently, the exponent, b, of 0.5 had been incorrectly assumed to be applicable to isotopic fractionation in magmatic liquids and in aqueous electrolyte solutions. Perhaps this was done for want of any experimental knowledge of the relevant b exponent for isotopic diffusion in liquid-phase situations. Richter, F.M., Liang, Y. and Davis, A.M., Isotope fractionation by diffusion in molten silicates, Geochimica et Cosmochimica Acta 63(18):2853-2861, 1999. Tsuchiyama, A., Kawamura, K., Nakao, T. and Uyeda, C., Isotopic effects on diffusion in MgO melt simulated by the molecular dynamics (MD) method and implications for isotopic mass fractionation in magmatic systems, Geochimica et Cosmochimica Acta 58:3013-3021, 1994. More recent research (unpublished data), suggests that b may be as high as 0.15, at least for the liquid-phase diffusivity of lithium isotopes. The low value of the exponent, b, diminishes the differences between the mass-dependent behaviour of heavy-element isotopes when compared with their light-element counterparts. Were comparative diffusivities to scale on a one-on-one basis with relative atomic masses, the one amu (atomic mass unit) difference between 87Sr and88Sr would amount to a meagre 1/87, in contrast to the 1/12 difference pertaining to the one amu difference between, say, the carbon isotopes (12C and 13C). Instead, the disparity between the behaviour of heavy elements and lighter ones is reduced. This makes it easier to entertain the possibility of appreciable mass-dependent isotopic fractionation in elements that are heavier than any in which isotopic fractionation has been found thus far. Brady, J.B., Diffusion data for silicate minerals, glasses, and liquids; in: Ahrens, T.J. (Ed. ), Mineral Physics and Crystallography: A Handbook of Physical Constants, AGU Reference Shelf 2, pp. 269-290, 1995. Fletcher, R.C. and Hofmann, A.W., Simple models of diffusion and combined diffusion-infiltration metasomatis; in: Hoffman, A.W. et al., (Eds), Geochemical Transport and Kinetics, Carnegie Institute of Washington Publication 634, pp. 243-259, 1974. In experiments now in progress, there are reportedly even higher values for diffusion coefficients of solute ions in aqueous solutions. Senftle, F.E. and Bracken, J.T., Theoretical effect of diffusion on isotopic abundance ratios in rocks and associated fluids, Geochimica et Cosmochimica Acta 7:61-76, 1955. At the quoted diffusion coefficients applicable to magmas, an element could only diffuse 0.83 cm in one day and 15.9 cm in one year. The high diffusive coefficients in aqueous solutions cause the same element, in the same two time periods, to diffuse at least 2.94 cm and 60 cm respectively. Consider, for instance, isotopes in an igneous environment. It is possible that, as crystals grow in a magma, there is isotopic fractionation going on at the crystal boundaries, since there is a concentration-gradient between the crystal and the magma. The diffusion rates of strontium out of minerals at high temperatures can be appreciable (Giletti, B.J., Rb and Sr diffusion in alkali feldspars, with implications for cooling histories of rocks, Geochimica et Cosmochimica Acta 55:1331-1343, 1991), and this observation is consistent with such a suggestion. But apparently no such fractionation has ever been measured. That is the main reason for the permil notation: even a percent notation would be inconveniently large in most cases (e.g. 1% equals 10 permil). Perhaps this is also why isotopic fractionation has not been studied in great detail for the heavier elements: it is commonly believed that any isotopic fractionation would be so small that, even if measurable, would be of questionable geologic significance. Moreover, it is supposed, such fractionation would have to be local in nature, as in a thin boundary layer that occurs between rock types or mineral phases of the same rock (Figure 1). Baumgardner, J.R., Distribution of radioactive isotopes in the Earth; in: Vardiman, L. et al., (Eds), Radioisotopes and the Age of the Earth, ICR and CRS, California, Missouri, p. 50, 2000. Of course, there were also extensive within-Earth movements during the Flood, but the primary movements within the earth must have been associated with the events which assembled planet Earth during Creation week. As summarized (by Meissner, R. and Wever, Th., The possible role of fluids for the structuring of the continental crust, Earth-Science Reviews 32:19-32, 1992), this includes the unexpected discovery of meteoric water in 20-km boreholes, as well as a variety of indirect evidences for deep crustal water. Much of the lower crust, in fact, may be a saturated environment with excess water in equilibrium with a hydrated mineralogy unfamiliar at the surface, thus explaining the high electrical conductivities which are measured (Gough, D.I., Seismic reflectors, conductivity, water and stress in the continental crust, Nature 323:143-144, 1986). Dreibus, G., Jagoutz, E. and Wanke, H., Water in the Earth’ mantle, Russian Geology and Geophysics 38(1):287-293, 1997. Hunter, M.J., The pre-Flood/Flood boundary at the base of the Earth’ transition zone, CEN Tech. J. 14(1):70, 2000. McDonough, W.F., Sun, S.-s., Ringwood, A.E., Jagoutz, E. and Hofmann, A.W., Potassium, rubidium, and caesium in the Earth and Moon and the evolution of the mantle of the Earth, Geochimica et Cosmochimica Acta 56:1001-1012, 1992. Russell, W.A., Papanastassiou, D.A. and Tombrello, T.A., Ca isotope fractionation on the Earth and other solar system materials, Geochimica et Cosmochimica Acta 42:1075-1090, 1978. Holden, N.E., Table of the isotopes; in: Lide, D.R., (Ed. ), Handbook of Chemistry and Physics, 79th Edition, CRC Press, Boca Raton, Boston, London (irregular pagination), 1998. McCulloch, M.T., Primitive 87Sr/86Sr from an Archean barite and conjecture on the Earth’ age and origin, Earth and Planetary Science Letters 12:3-13, 1994. I am not, of course, advocating the uniformitarian idea of the heavy elements forming in stars, but am simply considering the possibility that the processes by which God created the elements and their respective isotopes bears some resemblance to the nucleosynthetic processes believed to occur in stars. This notably involves neutron capture. We can picture God having first created some isotopes by fiat and then having created a shower of energetic neutrons to hit them in order to, in effect, manufacture other isotopes. Fuller, G.M. and Meyer, B.S., Neutrino capture and supernova nucleosynthesis, Astrophysical J. 453:806, 1995. This would occur in a neutrino/antineutrino-rich environment. The, L.-S. et al., A new study of s-process nucleosynthesis in massive stars, Astrophysical J. 533:1013, 2000. Some other studies show the same effect. Regardless of temperature (at least in the 5-100 keV range), the neutron-capture cross-section of 87Sr is apparently always greater than that of 86Sr (Beer, H. et al., On the calculation of Maxwellian-averaged capture cross sections, Astrophysical J. 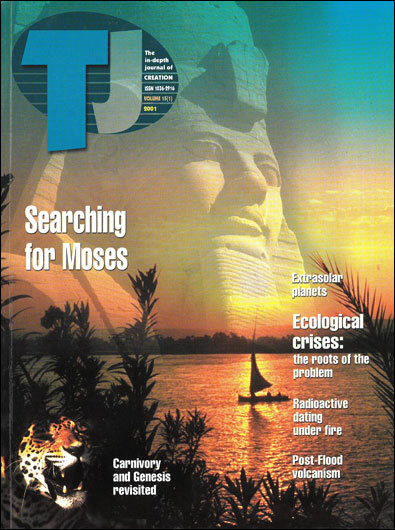 Supplement Series 80:414, 1992). This means that neutron-capture processes will usually convert 87Sr to 88Sr more rapidly than they convert 86Sr to87Sr. However, there is some uncertainty about this conclusion, as there exists an overlap of measurements of neutron-capture cross sections for 87Sr and 86Sr (Bao, Z.Y. and Kappeler, F., Neutron capture cross sections for s-process studies, Atomic Data and Nuclear Data Tables 36:430, 1987). An excellent tutorial showing how two-component mixing produces false isochrons is provided by Helmick, L.S. and Baumann, D.P., A demonstration of the mixing model to account for Rb-Sr isochrons, Creation Research Society Quarterly 26(1)20-23, 1989. Coloured beads are used for each of the relevant isotopes: 87Sr, 86Sr, and 87Rb. For instance, it is unclear whether the measured Rb/Sr ratios are adequate for explaining the 87Sr/86Sr ratios relevant to the composition of parts of the seafloor (Smith, A.D. and Lewis, C., The planet beyond the plume hypothesis, Earth-Science Reviews 48:135-182, 1999). Moreover, elevated 87Sr/86Sr signatures are turning up in locations where they are unexpected and where they cannot easily be accounted for by prior crustal contamination (e.g. Prestvik, T., Anomalous Sr and Pb isotope signatures in an off-rift volcano in southeast Iceland, Geological Society of America Abstracts with Programs 27(6)A-108, 1995). A nonradiogenic origin for elevated 87Sr/86Sr ratios frees researchers to consider other explanations for such isotopic compositions. Richter et al., Ref. 35, Figure 8. John Woodmorappe has an M.A. in geology and a B.A. in biology, from a midwestern US state university. He is a science educator by profession. He is the author of Studies in Flood Geology, Noah’ Ark: A Feasibility Study, and the recently released The Mythology of Modern Dating Methods.